This week kicks off Victoria's annual Cultural Diversity Week and I was fortunate to attend The Premier's Gala Dinner with my wife over the weekend to celebrate its launch. This year's theme is 'Our journey, Our stories' and it encourages us to share and listen to each other's stories and experiences. I wanted to use this platform to share with you how encouraged I was to experience such a diverse and enriching event. Our Premier, the Honourable Daniel Andrews, gave a compelling talk about the significance of Victoria's role in the diversity journey. "No matter who you are, where you are born or the language you first spoke, here in Victoria you can belong. We don't just tolerate diversity - we embrace it. It's part of who we are." He highlighted that while Sydney celebrates its aesthetics and Brisbane celebrates its weather, Victoria celebrates its multiculturalism. Our state is not only the most multicultural city in Australia, it is also one of the most multicultural cities in the world with citizens from more than 200 countries, who speak 260 languages and follow 135 different faiths. So my advice to you is the same advice I often give to myself: to be encouraged. The Victorian Government has set out a way forward that values equality, freedom and shared responsibility. It is committed to ensuring that every Victorian can contribute and belong in our communities, and importantly it is setting out the necessary policies, programs, services and funding that aim to meet and extend this commitment. As they put it best - "In short, our diversity doesn't limit our opportunities - it grows them." For more information on Cultural Diversity Week 2017 and the Victorian Government's commitment to a multicultural Victoria please visit proud.vic.gov.au. Newsletter Reader Question: Assimilation seems to be a popular buzzword in our culture at the moment. Why is it that when people (of a different national culture) arrive in a new country they tend to stay together and form their own mini-communities? First of all, I find that the word assimilation is a very loaded term. Australia, in particular, has a shameful history of assimilation policies that up until the 1960s sought to create a single, uniform white Australian culture to the devastating detriment of Indigenous communities. For this reason, I prefer to use the term cultural integration. Cultural integration is the process of cultural exchange in which one group assumes the customs and practices of another group without sacrificing the characteristics of its own culture. Cultural integration occurs when communities and government work together to celebrate diversity and contribute to the continual and positive progress of community needs. Multiculturalism and its policies are designed explicitly to make cultural integration a reality in Australia. Under multiculturalism, when different cultures arrive in Australia they must be encouraged to keep their native languages, customs, religions and cultural ways. For each one of us, our national culture is a significant part of our personal story, our individual self. Newly arrived cultures tend to stay together because it provides an opportunity to maintain a sense of familiarity and comfort. It also allows people the chance to sustain their prized cultural traditions, whether it is song, dance, food, storytelling, etc. At the same time, these same cultures must also be encouraged to support a commitment to Australia and its national values. These two ideas need not and must not be exclusive if we want to create healthy, diverse and respectful communities. One final point I want to make is that cultural integration is not always easy, for either culture. For many new arrivals, staying together is a crucial mechanism of support; many people come to Australia to escape hardship, trauma or worse in their native countries. Integrating into a new community can be extremely challenging. And for the local population, in an often-fraught and divisive political climate, accepting difference may require sustained effort and a certain vulnerability of acceptance. Diversity is here to stay, and we must all practice behaviours of inclusion to help it thrive. Cal Newport is an Associate Professor of Computer Science at Georgetown University and the author most recently of Deep Work, a book that argues that focus is the new I.Q. in the modern workplace. 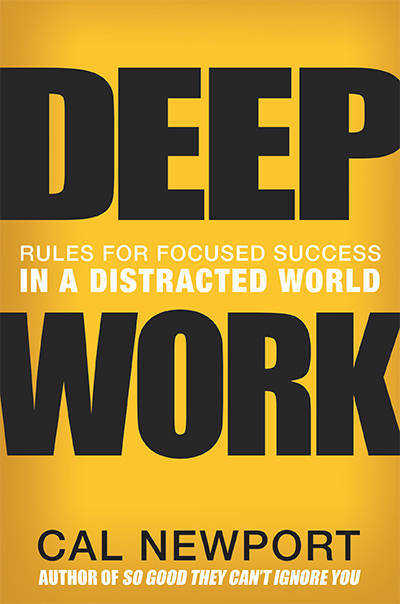 Deep work � the idea of focusing without distraction on a cognitively demanding task, is becoming increasingly rare in our ever-connected world. It is precisely for this reason, Cal Newport posits, that the ability to embrace deep work is becoming more valuable in our economy. The goal of deep work is to allow you to produce at both quantity and quality levels that will not only amaze your peers (and initially yourself), but will actually enable you to find your work more meaningful and less exhausting. Using four basic rules - Work Deeply, Embrace Boredom, Quit Social Media and Drain the Shallows (shallow obligations) � Newport�s book illustrates how you can radically transform your work life and create a regular routine of focusing with great intensity.